Fundamentals of Space Biology is the third textbook addressing Space Life Sciences in this Space Technology Library series. The first of these books focused on the psychological and psychiatric issues that affect people who live and work in space (Volume 16, Space Psychology and Psychiatry). The second book described the physiological and medical issues of living in a space environment (Volume 17, Fundamentals of Space Medicine). 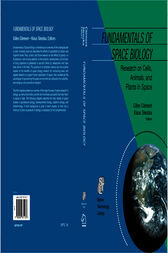 The objective of this third book was to review the effects of spaceflight on less complex biological systems, from single cells to animals and plants. Indeed, to better understand the changes at the function level, it is necessary to comprehend the changes at cellular and tissue levels. Studies of cell cultures, for example, allow the investigation of the indirect effects of gravity; i.e., those which occur not because of changes in the stimulation of dedicated gravity-sensing organs, but because of the new physical properties resulting from the reduction in gravitational force within the cell.